The towns of Chili and Riga, along with the Village of Churchville, have been looking at implementing a trail system along Black Creek, which runs through all three municipalities. Earlier this year, the three communities received a grant from the Genesee Transportaton Council totaling a little over $60,000 to study the topic. The municipalities kicked in $6,000 amongst them and some in-kind services, according to Chili Supervisor David Dunning. The study is researching the feasibility of building approximately 15-mile-long multi-use trail system parallel to the Black Creek stream and linking Black Creek Park, the Genesee Valley Greenway, and Churchville Park. Representatives from Bergmann Associates and Steinmetz Planning were retained to conduct the study. The creation of a trail along Black Creek is an idea that has been bandied about for quite some time, Dunning said. He would like to make use of the “untapped resource” that is the park. “I thought, ‘What a great opportunity this would be if we could get a trail along this creek,'” he said. The study is almost wrapped up, according to Dunning. A second public meeting was held last week. Previously, there was talk of the trail having to be installed on some private land. Residents strongly spoke out against it, he said. “None of us are interested in exercising eminent domain or devaluing properties,” he said. The latest recommendations include installing the trail along public properties and public right-of-ways and avoiding private property. Putting the trail on private property was a concern from some owners, Dunning said. The final recommendations will be revealed in the study, which he expects to be finalized early next year. “They’ll give some recommendations, as well as some preliminary cost estimates based on what the cost might be today to put in a trail,” Dunning said. Estimates right now stand at $1 million per mile. Dunning said he hopes to see the Black Creek trail become a reality for his town, which has a small trail in Union Station and another in Chili Nature Park. But the odds are not in his favor, he said. He added that the study will yield a lot of useful information that will guide future planning for a trail. For more information about the feasibility study, go online at www.townofchili.org or www.TownofRiga.org. Walkers on the Genesee Valley Greenway Trail approaching the Genesee River at Route 36 no longer need to ‘break’ route onto the highway bridge. Although the highway bridge has a sidewalk, getting to it from the Greenway required trail users to risk their safety — especially in winter — by walking along the roadside of Route 36 and the staying on the apron of Sickles Avenue, a Mount Morris Street without sidewalks. The new pedestrian bridge, dedicated last Saturday, makes an unbroken continuation of the trail across the river, following the route of the old “Pennsy” Railroad that went out of service in 1963. In fact, the entire Greenway follows the route of the “Pennsy” Railroad, and before that the Genesee Valley Canal, which operated from the 1840s to the 1870s. The piers, constructed using granite to support the railroad bridge, are now bearing — with some modifications — the weight of the pedestrian bridge. “I find it fascinating that the piers are linking the old and the new,” remarked Regional Director of Transportation Bob Traver. Planning for the pedestrian bridge began in with the Mount Morris Main Street Highway reconstruction project about ten years ago, and the $1.7 million cost of the bridge was covered by monies from the American Recovery and Investment Act of 2009. The fabricated steel sections were constructed off site and transported to the river area for installation. The concrete floor and 12 foot width will allow emergency vehicles to cross. The structure is 450 feet long. A large ceremonial ‘Gold’ Nut and huge Wrench were exhibited to commemorate the turns of the last nuts and bolts that join two sections of the bridge at the center. “A nut that big was hard to find,” said Dave Nagel, grinning from ear to ear. Nagel, a Friends of Greenway Board Member and retired schoolteacher, got the nut from a former student who owns Blum Brothers Customs, a metal and automotive shop in Fowlerville, NY. He picked up the wrench from Second-Chance Merchandise consignment store, corner of Routes 36 and 63. Both businesses donated these expensive items; the nut, according to Nagel, carried a retail price of around $80. The 90 mile long Genesee Valley Greenway extends from Genesee Valley Park in Rochester to Cuba, N.Y. in the Southern Tier. In 1991 the first section of the Greenway opened in Mount Morris. The Genesee Valley Greenway is one of more than 1100 greenways winding their way across America, transforming old canals, abandoned rail beds and forgotten riverbanks into green recreational corridors. The cinders of old railbeds provide a firm, level surface for walking, jogging, biking, horseback riding and cross county skiing. The Upper Genesee Trail is nearing the one-year anniversary of the launch of the latest addition to its trailhead. The milestone may provide cause for a moment of reflection, a brief respite to consider how far the trail has come, but Allegany Trails, Inc. is too busy forging ahead with future successes to spend too much time in the past. 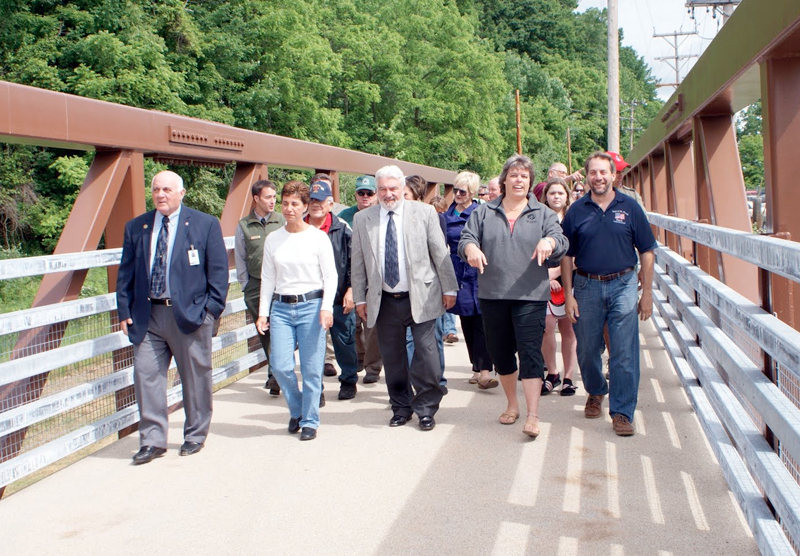 The Wellsville non-profit organization opened the newest stretch of the Upper Genesee Trail on July 14, 2011. The 12-foot wide stone path runs on the west side of the Genesee River, from the south line of the village of Wellsville to the high school. The recent addition is between the Alfred State College campus on South Brooklyn Avenue and the river. A foot bridge over the Genesee takes walkers to the east bank and Island Park, providing Wellsville with a hub for outdoor recreational activities 365 days of the year. Dibble’s vision for the trail is extensive and far-reaching, though the future is now for certain aspects of the plan. Allegany Trails hopes to line the Upper Genesee Trail with several dozen benches to provide travelers with a place to relax and enjoy the view. The 8-foot long metal benches will have the name of sponsoring businesses or families cut into them, providing a lasting legacy along the trail for generations to come. An $800 donation covers the entire cost of the bench, from freight to installation. The first two benches are on display at Steuben Trust and Community Bank in Wellsville. Allegany Trails is working to extend the Upper Genesee Trail past the high school and on to the Riverwalk Plaza. From there, the group hopes to put its base of Wellsville far in the rearview mirror, pushing on to Scio and then Belfast, where it can link up with the Genesee Valley Greenway. That trail follows the Genesee River to the south end of Letchworth State Park and north all the way to Rochester. “We want to have the Rochester folks and the Rochester Bicycling Club be able to actually tour the whole Genesee River, at least down to Genesee, Pa.,” Dibble said. “It can be done. It just takes a little bit of effort to put the pieces together. Allegany Trails is working to expand the Upper Genesee Trail holdings in Pennsylvania, where the Genesee begins. It also has its hand in forming and growing other trails around Allegany County, an agenda that includes joint efforts with Alfred University. The all-volunteer organization depends on the passion of its members and the generosity of the public to advance its mission. Insurance costs alone require around $3,000 a year in donations, Dibble said. Any trail system is constantly evolving, and the Upper Genesee is no different. The trail has gone by several different names, including the River Trail and the WAG Trail, after the former Wellsville-Addison-Galeton railroad. “In a grant we wrote for the DEC it was called River Trail, but there’s lots of rivers,” Dibble recalled. “We thought about it, kicked around some ideas. We said let’s call it the Upper Genesee Trail. Of course the Genesee, that goes to Rochester. The Upper Genesee, that’s us.